" and in the ribbon bow is the motto "PERSERVERANCE AND INTEGRITY" above a set scales representing justice. Linking the banner and the bow are the words "HIGH ST"and "BURSLEM", which is the address of the factory where the National Union of Operative Potters briefly conducted their own pottery business. 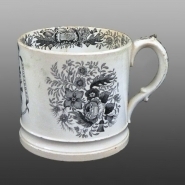 Side view of the mug showing the floral bouquet and the printed border on the inside with the clasped hands. The reverse of the mug with another floral bouquet. Earthenware mug with black printed decoration. 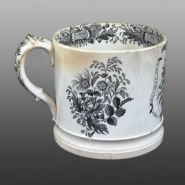 On each side of the mug is printed a floral bouquet, and the interior has a floral border including a device of clasped hands. On the front of the mug is printed a design representing a pottery trade union. The central image is a beehive, a symbol often used in freemasonry, and generally recognized as a symbol of industry and cooperation; above the beehive flies a dove with an olive branch, and the whole is garlanded with the national flowers of the countries that make up the United Kingdom of Great Britain. A banner ribbon supports the words "SOCIETY OF OPERATIVE POTTERS" and in the ribbon bow is the motto "PERSERVERANCE AND INTEGRITY" above a set scales representing justice. Linking the banner and the bow are the words "HIGH ST"and "BURSLEM", which is the address of the factory where the National Union of Operative Potters briefly conducted their own pottery business.